To foster an environment of international artistic exchange while providing a rich working experience for the artist to practice and grow. The School of Art strives to cultivate a dialogue between the international art community and the community of Bozeman, Montana. The iAIR program at the School of Art is supported in part by the Beulah Glaze Waller Endowment. Founded in 1893 as the state’s land grant college, MSU’s School of Art was originally a center of creativity promoting good design for the manufacturing and craft industries. Our role has continually evolved and redefined itself to reflect the needs of the communities we are part of. Now as then, our vision remains the same – to provide a world-class creative education which makes a significant cultural, social and economic contribution to the university, to the broader community and to the global community as a whole. Bozeman is a city in and the county seat of Gallatin County, Montana, United States, in the southwestern part of the state. Bozeman has experienced a healthy pace of growth. Over the past 40 years, it has grown from the 6th to the 4th largest city in the state. The area continually attracts new residents due to quality of life factors, scenery, and nearby recreation. In August 2010, Bozeman was selected by Outside Magazine as the best place to live in the west for skiing. The incoming flight will be scheduled for arrival in Bozeman on Sunday, February 1st ; departure flight will be scheduled on Saturday February 28th 2015. The iAIR program is a multidisciplinary residency, open to all forms of visual arts and design, selected by a peer review panel of 6-8 members. Applications are open to emerging, mid-career and established international artists. Artists must be fluent in English in order to communicate and interact with faculty, staff, and students. Artists absent from residency in excess of four (4) days requires prior arrangement with residency director. Absence may jeopardize artist’s residency. Artists currently living in the U.S. are not eligible to apply for this program. Current undergraduate and graduate students are not eligible to apply for this program. Applications are to be submitted online at https://hecgallery.submittable.com/submit/25875. Applications will be accepted through Friday September 19th 2014, 6PM MDT (Midnight GMT). There is a $35.00 USD application fee due at the time of submission. Applicants should submit the following documents: a CV or résumé; an artist statement (maximum 500 words); an image list which corresponds with submitted works; and a residency proposal (maximum 500 words). Please submit each document separately as a Word document or a PDF. In addition to the documents, please submit 8-10 images or A/V files. Images should be a maximum of 1200 x 800 pixels and audio or video clips should not exceed 2 minutes each. Accepted formats are JPEG, TIFF, PNG, MP3, MP4, WAV and MOV. The iAIR will have access to a semi-private studio space in the Melvin Graduate Art Studios. Each personal studio space is provided with three walls and two windows that look out at either the Gallatin Mountain Range or the Bridger and Spanish Peaks Ranges. There is a tool room with band saws, a table saw and a drill press. With a private electric salt kiln, ceramicists are free from the sharing of mass kiln firings. The Melvin Graduate Art Studio also provides Internet access through several shared computer stations (PC and Mac) and Wi-Fi. Following appropriate inductions, the iAIR will also have access to the following facilities at Haynes Hall: ceramics, printmaking, letterpress, digital labs, wood workshop, metals workshop, sculpture yard and a small B&W darkroom. In the six-week residency, the artist will live in a private, furnished apartment on campus; which is a 5-minute walk to the School of Art in Haynes Hall and a 15-20 minute walk to their studio space at the Melvin Graduate Art Studios. Laundry facilities are not provided in the apartment; however, there are many facilities available on campus and within Bozeman. The apartment also includes one parking space; in the instance that the iAIR should wish to hire a car. Artists are expected to keep their apartments in a neat and orderly fashion. The apartments are furnished and clean upon arrival, and should be left in the same condition upon departure, normal wear and tear excepted. No unauthorized persons or pets are allowed to reside in apartment with the artist. Please note that Montana State University is a Tobacco Free campus. Application fee – $35.00 USD, US Visa Expenses, personal medical insurance, living expenses, material costs above what is provided by the School of Art, transportation once in residence and any shipping of artwork to and from the residency. Roundtrip airfare to Bozeman, pick-up and drop-off at the airport, housing/utilities, studio, materials assistance (up to $250.00 USD), program administration, and a General Stipend of $1000.00 USD ($900.00 upon arrival and $100.00 as room deposit – to be given to the iAIR upon completion of the residency). The School of Art at Montana State University has created this program to develop a relationship between the artist with the students, faculty and community of Bozeman, MT. “Conversations about Art” is an informal dinner gathering which seeks to create a forum for exchange between the iAIR, faculty members and graduate students. “Ways of Seeing” includes a public lecture and image presentation on their practice to introduce the iAIR to the community. It is also expected of the iAIR to participate in a minimum of one lecture for the School of Art Foundation classes and at least one group critique session with the graduate students. Further participation in teaching and lectures across the School of Art is expected throughout the residency. Open studio is optional but encouraged. 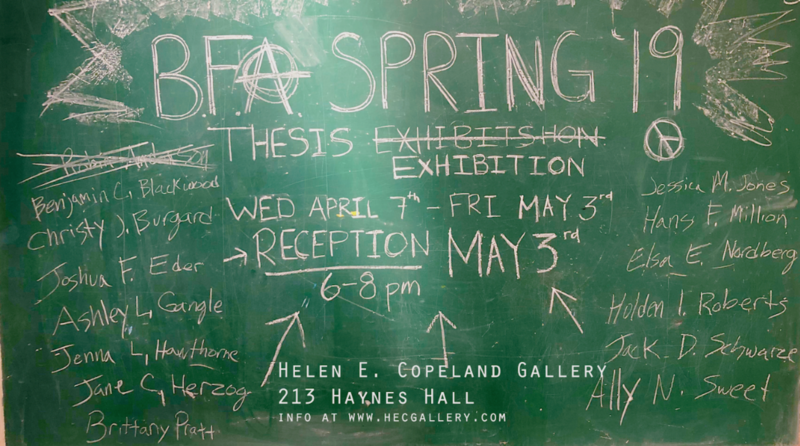 The iAIR is also expected to participate in an onsite exhibition at the Helen E. Copeland Gallery at the School of Art. Residents may participate in any of the other classes, critiques or workshops offered at the School of Art during their stay.